This is from—I don’t know. A place where they have lots of muskrats! This man’s parka is made from more than 40 muskrat bellies. It has a wolf and wolverine-trimmed hood and white caribou fur trim Muskrat makes a very warm coat that is also light in weight. Neva Rivers: This is made from muskrat stomach side. And this, as is it decked up with trims and all, these are for the men. For the men or for the boys. John Phillip, Sr.: Wolverine [trim at bottom edge of parka]. Virginia Minock: Iluqliqellriignek-llu negilirluni. Tang. Iluqliqlutek negilik. Wolf-aq wolverine-amek iluqlingqerrluni. Neva Rivers: Mm-hmm. They put a wolverine in here [brown trim at bottom edge of parka body and sleeves] and colored one [red band above wolverine trim]. 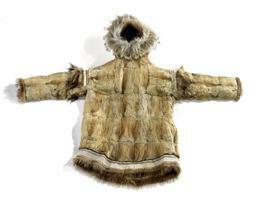 And this one is a sheared reindeer [white trim at bottom edge of parka]. Some are sheared, but some of the animals, they have shorter hair near the leg area. And they put fancy red [pattern on white trim] that we have seen, all those red ones from Russian side. Unuuguq-qaa tungulria [is that one (narrow trim above white trim) a black one]? Neva Rivers: And they use a wolverine in here [tassels on parka shoulders]. It’s the same thing as they did in here [trim at shoulder same as at bottom of parka]. If it’s not from the tail of a wolverine—this little lining [narrow trim], that black one—they sewed it on like us. They put reindeer [chin] hair in here. Man’a-llu negilia [and this part is the ruff], around the face. This is for [making it] wind-proof, so the wind won’t go in their face. Joan Hamilton: It’s protection from the wind. Neva Rivers: They put wolverine in here [first outermost layer of ruff, where ruff meets hood]. Wolf [second layer, behind long-haired layer of ruff] so this [long-haired third layer] don’t rub off that fast they put this on back. And the long one [long-haired third layer]. And they put this one in here [fourth layer in front of long-haired layer] to protect this one [long-haired layer]. And they put this one next to the wolverine [fifth, innermost layer]. They [ruffs] protect against the wind, that’s why it’s made like this all the way. Neva Rivers: And the hood would be fitted. And they will put on a naquguteq [belt] if it’s too windy, to protect against the wind. This is for the boy. Virginia Minock: And the hood is made of? Neva Rivers: Makut tamalkurmeng [all of these (pieces of fur)] are the muskrat stomach part. Virginia Minock: What are those red little dots? Yarn? Joan Hamilton: That is kassartaq [a manufactured item], that red we saw. They’re pieces of that. Virginia Minock: O-oh, red blanket. Joan Hamilton: Caaqameng tua aturlallruatgu? Neva Rivers: Tava atkukluki wangkucicetun-wa uksumi atkukluku. Aron Crowell: Would this be a parka for the summertime? Neva Rivers: They don’t have much change of their clothes. They have to use it year round. Aron Crowell: Do they ever have furs on the inside too? Neva Rivers: Some do. If they have enough, they put fur inside and outside. Fur out since they have no cloth at that time to put over on them. This is for all year round, as long as you have a need to wear a parka. Fur out-alriit maqanruut [the fur-out ones are warmer], the ones that we wear. That’s why a lot of the people make them fur-out, because it’s warmer. Suzi Jones: So, what area do you think that’s from? Neva Rivers: This is from—I don’t know. A place where they have lots of muskrats [laughs]. But they have to go out from that place to get all those, to hunt all those muskrats. They hunt in the springtime. Piliqellrulliniami wani-w’ makuneng una atkungqertuq aqsaitneng [since he caught many muskrats, he has a parka made of the muskrat abdominal area]. Suzi Jones: What are the qualities of muskrat fur compared to other kinds of fur. Joan Hamilton: Ilait-qaa assikenrularait nenglliraqan maqanruluteng? Suzi Jones: Is it as warm as mink? Or warmer? Joan Hamilton: Same as mink. Neva Rivers: Squirrel [parkas] have to have two [layers], one outside and the other inside. Joan Hamilton: Because it’s too thin. Neva Rivers: The ones made from squirrel have lots of holes. To protect against the wind they make another one for inside. They use both inside with hair and outside with the hair, because squirrels [skins] are very thin. Muskrat skins (a single layer) and Arctic ground squirrel (double layers) were used for winter parkas because these furs are light in weight but very warm. (5) However, caribou (or its domesticated cousin, the reindeer, introduced to Alaska in the 1890s) is also quite warm and also more durable, making it perhaps the most desired material for winter clothing. (6 Wolverine hair is ideal for parka hood ruffs because it does not collect the frost produced by breathing, and its long hairs block the wind to prevent frostbite.